There are few things that fit as seamlessly into everyone's wardrobes as the denim jacket. This classic-cool staple is the piece to own when it comes to mixing and matching. Your look could could be inspired by designer labels, urban street style, or James Dean—and a denim jacket would fit perfectly in your wardrobe rotation. With that in mind, we're exploring five fresh ways to wear this never-going-anywhere essential. Talk about versatile. Does your style lean toward laid-back? Then you should consider this your fall uniform. 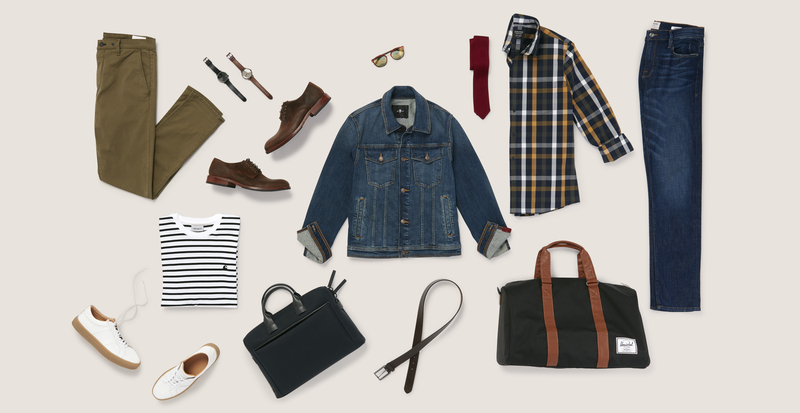 Start with a base of slim-fit jeans and a plaid work shirt. The jacket can be layered on or off throughout your day. Complete the look with leather or suede to balance all that denim: a pair of Chelsea boots and a simple belt will do the trick. If this is your go-to combo, you can still give it extra style. 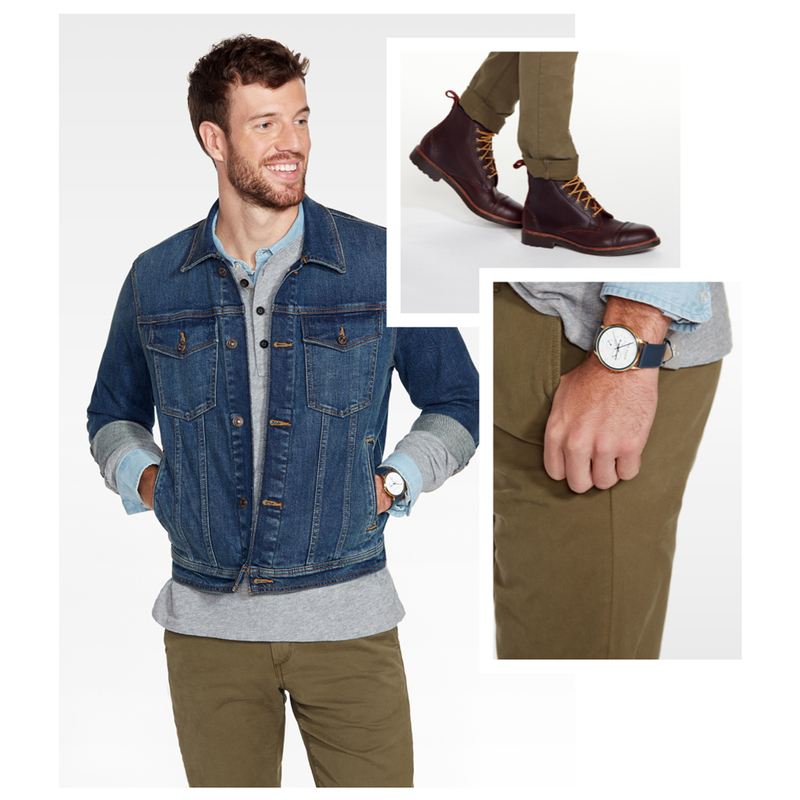 Layer a denim jacket over a long-sleeved tee in earth tones, then cuff the jacket sleeves (just once is enough). Regular-cut jeans in a dark wash will make clean white kicks really pop. 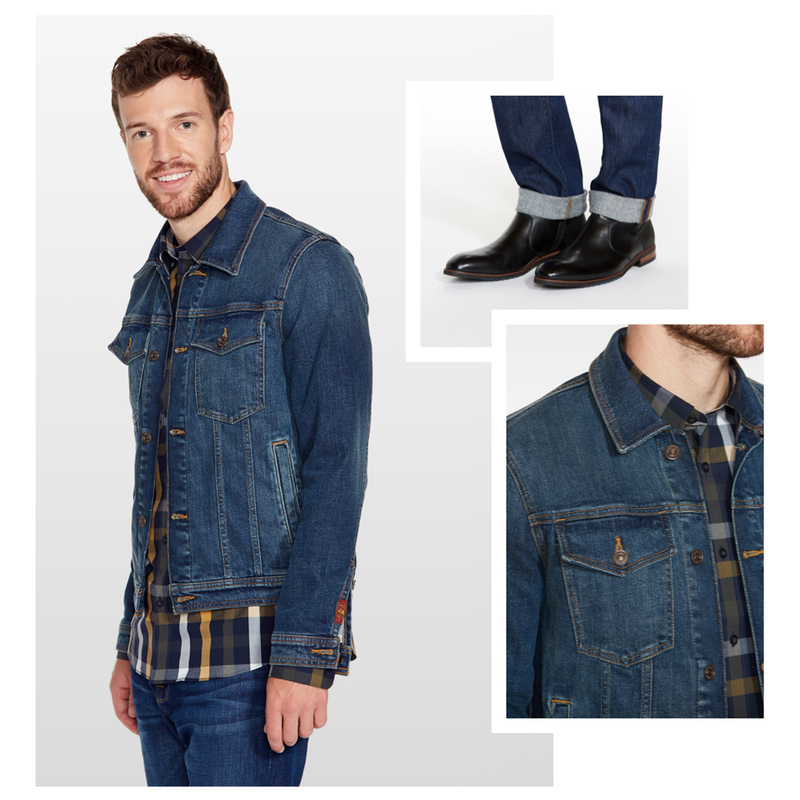 A denim jacket is perfect for pulling off a rugged look that's cleaned up around the edges. Start with slim-fit chinos in dark moss and a fitted chambray shirt. Experiment with layers by adding a henley on top, leaving the top button undone to give your collar room to breath. A handsome watch and classic work boots are the ideal finishing touches. 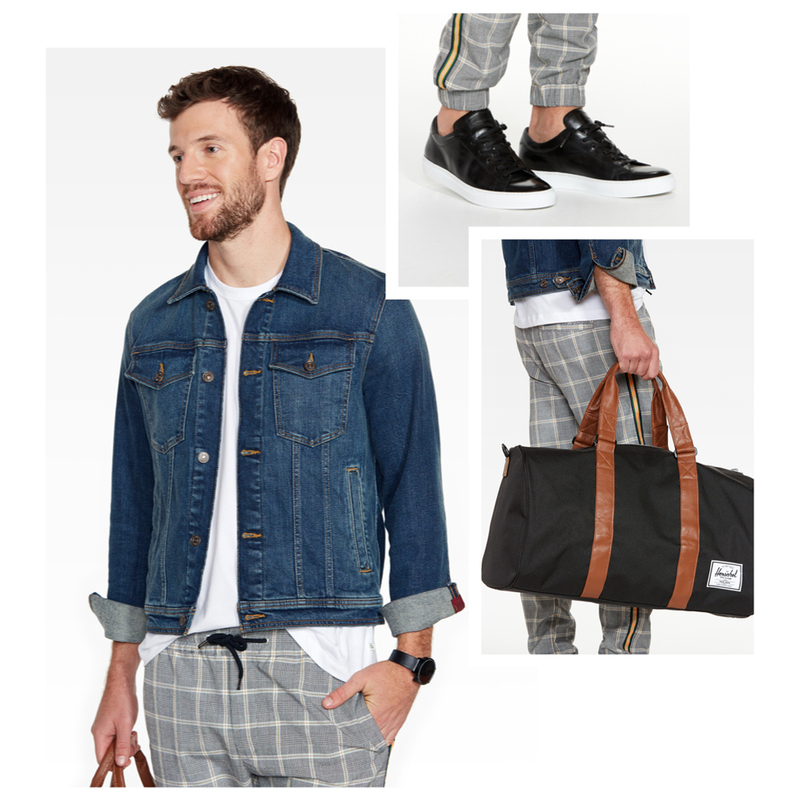 For a casual look that feels modern, put the emphasis on contrast: a cool pair of joggers with a plain white tee and a black leather shoe with a bright white sole. A leather jacket would be too much, and a parka would be too casual—that’s why a denim jacket is just right. 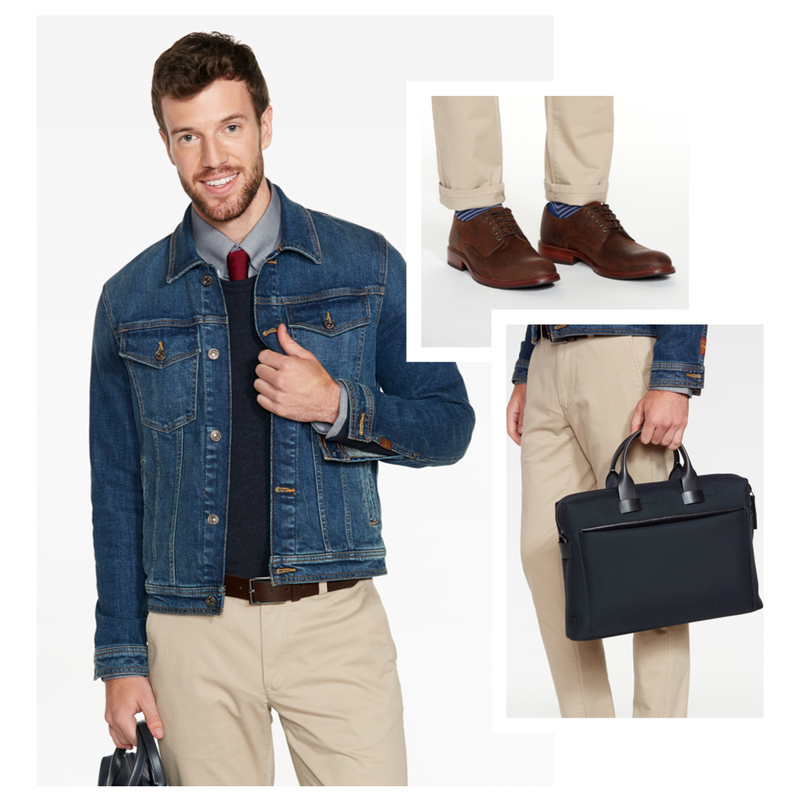 If your office dress code is business casual, you might be surprised to learn how seamlessly a denim jacket fits into your workwear mix. Go with your standard formula of polished pieces: button-down, V-neck sweater, and chinos paired with a tie and derby shoes. Top off with denim and you’re out the door.